1.) With the bead at the eye of the hook, catch in the wire at the bend and start to work towards the eye of the hook. 3.) Ensuring the turns remain touching by holding the leading tag secure, wind the loose end of the wire over the body in open turns to form the rib. Be careful to keep the underbody tight together – or else the rib will slip between the wire base wraps. Keeping pressure on the wire wraps towards the eye will help, as will angling the rib more steeply. 4.) Secure the rib with the leading wire tag. Catch in the thread and secure the wire. Trim the loose ends. 5.) Spin the bobbin anti-clockwise to unwind the thread. Split the thread with a dubbing needle and inserts your chosen dubbing. 6.) Re-spin the bobbin holder to trap the fibres in the thread – then wind forward to form the thorax. Sweep the fibres backwards with each wrap. 7.) Whip finish behind the bead. Very nice work. I love the wide range of colors you tied those in. Simple fly that still works. I like to tie these for kids to use under bobbers on spinning rods, for the same reason that they get down quick. Kids need quick since they often want to just reel the line in before the fly gets down. 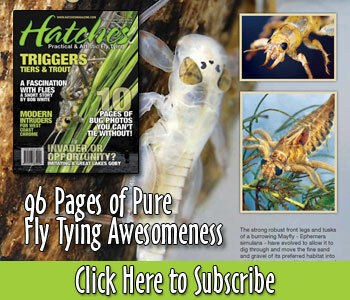 This is a great artical, simple fly to tie, and brassies are great for the big bows here in British Columbia. To keep your price per fly down try tying these on Togen Scud hooks. Looks like some great general purpos nymphs. I think I’ll spend some time tying a few this winter for use next summer. Thanks for the comments. It really is simple; but very, very effective. nice article, flies and sbs Dave. brassies in all their variants are a sure bet. thanks ! Gracias! Espero que funcione bien para usted. another example of traditional patterns with a fresh look.thanks again dave,those brassie’s would knock grandad’s sox off. we are blessed with the materials available to us. your articles give me much inspiration. Thanks Dave!! A great looking nymph that I know will be a killer here in the Sierras! Thanks folks. Try it in very small sizes with micro-gauge wire. Can be very effective! Outstanding photography and excellent instructions. I would like a little more info on how you fish them. thanks. I was looking for a pattern like this that would work right now!